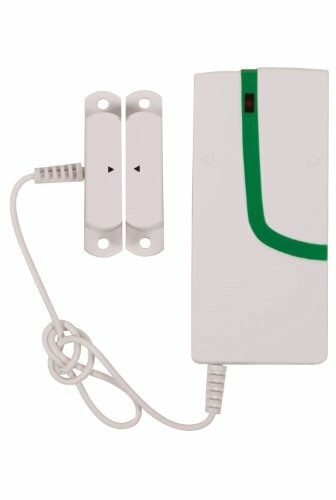 Safety Technology International, Inc. - STI WS105 Burglar Stopper Garage Door Sensor. When you install this sensor directly to your garage door, you’ll be informed every time the door is opened and alerted of potential intruders. Protects access points around your property and is ideal for use on raised and lowered doors. Used as an accessory to the STI Burglar Stopper Wire-Free Home Protection System (STI model WS100SG2 sold separately) the sensor ensures every aspect of your home is safe and secure. This motion sensor is ideal for roller shuttle garage doors but may be used on other types as long as they fit the installation requirements. Low battery warning alert. Easy installation with the included install kit. Requires two AAA alkaline batteries (sold separately) to function. Sensor operating temperature: 14 to 113 degrees. One year limited warranty from date of purchase. Safety Technology International, Inc. "We protect the things that protect you"